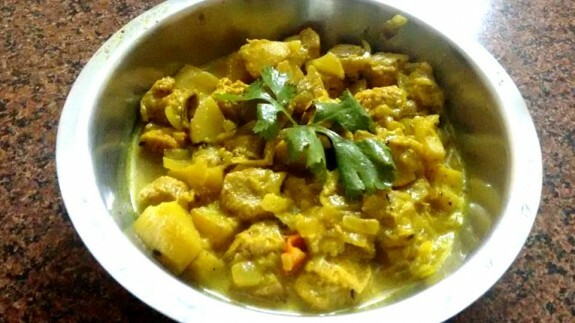 Soya Chunks Sabji is an Indian curry based vegetarian recipe majorly famous as North Indian recipes. This is a protein based healthy recipe which goes best with roti or chapattis during lunch or dinner. You can also have this with rice also. 1. Soak the Soya chunks in 2 cups of hot water for 15-20 mins. 2. Squeeze the water from chunks and run it through cold water. Again squeeze it properly. 3. Heat oil in a pan. Add cumin seeds, cloves, cardamoms, bay leaves and cinnamon stick. Fry for 1-2 seconds. 4. Add chopped onions and green chillies and sauté it for 1-2 mins in low flame. 5. Add ginger garlic paste and sauté it for few seconds. 6. Now add the chopped tomatoes and cook on medium flame till tomatoes are tender. 7. Add turmeric powder, salt and other spicy powdered masalas. 8. Saute it for few seconds till oil separates. 9. Add curd and soya chunks into the tomato mixture. Mix everything well. 10. Saute again till oil separates. Now add water and cook for 10-15 mins or as required. 11. Garnish with coriander leaves and serve this with roti, chapatti or rice. Note: You can also add small potato cubes in this recipe. For this, you need to cut small cubes of potatoes and fry it in the beginning and keep it aside. When you add granules, add the fried potatoes into this to cook.